Lama Sonam Tsering has an extraordinary way of conveying the wisdom and compassion of the Buddhadharma to young people and adults in the West. Closely connected with the Dudjom Tersar lineage, he is a humble practitioner with boundless energy for the dharma. 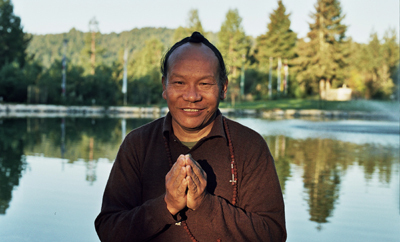 Lama Sonam began his dharma education studying with his father in Tibet. In 1959 his family left Tibet and traveled to India. After several years, the family resettled in Orissa near Dudjom Rinpoche’s monastery, Duddul Raptenling, where he studied the Dudjom Tersar lineage and ritual arts, and became accomplished in the kyerim and dzogrim stages of vajrayana practice. Following this, he attended The Nyingmapa Wish-Fulfilling Center of Study and Practice, Dudjom Rinpoche’s shedra, where he was educated and graduated after nine years of intensive study. He also received teachings from many other great nyingma lamas and khenpos. Under the guidance of Dudjom Rinpoche, Lama Sonam completed his extensive Buddhist education at the Nyingmapa Wishfulfilling Center for Study and Practice ('Ngagyur Shedrup Dodjo Ling'), receiving the advanced degree of Khenpo, equivalent to a Doctors degree, in Buddhist philosophy, art and science. He received the complete teachings, empowerments and instructions on the Dudjom Tersar and other Nyingmapa traditions from many lamas and Khenpos. In 1983, at the invitation of Chagdud Tulku Rinpoche, Lama Sonam Tsering immigrated to America. In 1988, he became resident lama of Chagdud Gonpa Dechen Ling in Cottage Grove, Oregon, United States. He has worked tirelessly behind the scenes for many years supporting the activities of numerous nyingma lamas in the West: helping to establish Dharma centers, teaching the meaning of practices, training students in the ritual arts, and supporting the efforts of Western practitioners to find the truth of Dharma. For many years, Lama Sonam has also been a trusted dharma brother of Lama Tharchin Rinpoche, the founder of the Vajrayana Foundation, In 1999, Dungse Thinley Norbu Rinpoche and Lama Tharchin Rinpoche both entrusted Lama Sonam to oversee and guide the Vajrayana Foundation, Pema Osel Ling Retreat center where he currently resides. He is also a Founding Director and President of the Saraha Nyingma Buddhist Institute. Lama Sonam now resides at Pema Osel Ling, but continues to support the students of Dechen Ling. This page was last edited on 8 February 2018, at 19:44.